I've got a neat car I've been working on. I've needed a place to document and keep track it's history and figure this is a pretty good place to do so. As I keep finding more information I'll continue to update this thread. The car is a body-in-white race car build with serial number 965006. Most basically speaking it's a 1994 Porsche 911 Turbo. In Porsche internal numbers that's a 964 Turbo which is sometimes referred to as a 965. Porsche denies that a 965 was ever built beyond one prototype (which had a water cooled V8 in the back), but the serial number they stamped into this chassis along with dozens of 965 prefixed part numbers suggests otherwise. It had a 3.6L flat 6 twin turbo engine making something in excess of 600bhp. All of the suspension is factory Porsche RSR components down to the brakes and center lock wheels. The body includes real factory RSR Lightweight aluminum doors and hood which are exceptionally rare. Rear flares, bumper, wing, and front bumper with splitter were DP Motorsport. The car was raced in BPR GT1 through the first half of the 1995 season including the Monza 4 Hours, Paul Richard 4 Hours, Jarama 4 Hours, Nurburgring 4 Hours, and then on to Le Mans. As of yet we cannot figure out why, but the car qualified 47th for Le Mans yet did not participate in the race and was not seen again that year. In 1996 the turbo engine was removed and replaced with a 3.8L RSR naturally aspirated engine as documented in the log book. 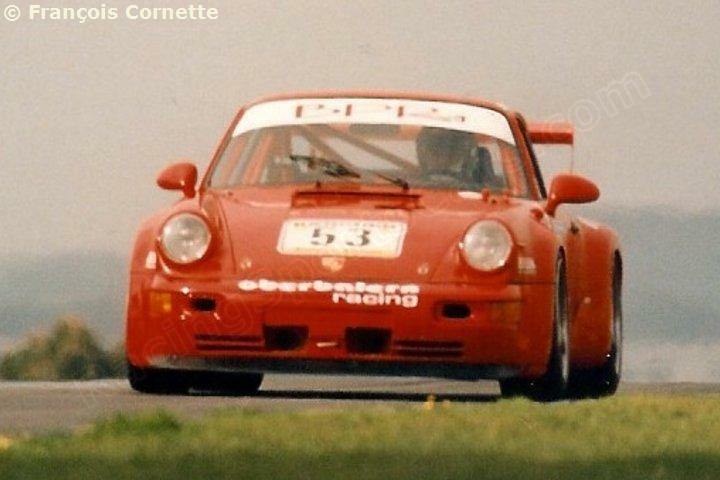 Some time around 1997 the car was to be entered in FIA GT racing, but of course the 964 body was too old so the front end was converted to look like a, then current, 993 using factory fenders with DP Motorsport flares and bumper. The ONS WagenPass does not include any further entries, but we have been told it competed. Nonetheless we plan to undo this work and put it back to it 1995 configuration later this year and fortunately all of the original bodywork except the front fenders was included in the purchase. The car was imported in about 2003 by an unknown party then sold to a fellow in Colorado who raced the car in PCA through about 2008. He stopped racing it and listed it for sale at the end of 2008, but did not include much about the cars history. It sat collecting dust for nearly 3 years before my customer purchased the car for an amazing deal. Suffice to say that a stock street 964 Turbo would cost you MUCH more. The car didn't run well at the time and the new owner spent a few years tweaking on it in his spare time before ultimately looking me up. The car was imported in about 2003 by an unknown party then sold to a fellow in Colorado who raced the car in PCA through about 2008. He stopped racing it and listed it for sale at the end of 2008, but did not include much about the cars history. It sat collecting dust for nearly 3 years before my customer purchased the car for an amazing deal. Suffice to say that a stock street 964 Turbo would cost you MUCH more. Quite an interesting and rare car. It is cool that you have been able to figure out what it is and are taking it back to period. Keep us up to date on the progress!